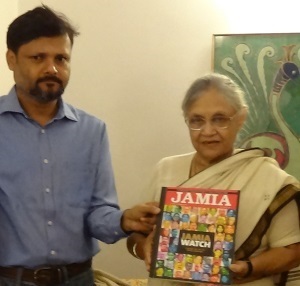 New Delhi, July 29: Delhi chief minister Sheila Dikshit released the first-of-its kind Jamia Yearbook yesterday at her residence. The yearbook, a presentation by hyper-local website OKHLATIMES.COM, features lives of 60 Jamia alumni, including Bollywood superstar Shah Rukh Khan, cricketer Virender Sehwag, Union minister Salman Khursheed, and others who forged successful paths in diverse careers ranging from politics to architect to acting to the media. The 104-page glossy book is authored by Asad, a Jamia alumnus and editor of the website. Priced at Rs 1000, it is the first such book on the lives of Jamia alumni in the 94 years of its history. Established in 1920, Jamia became a central university through an act of parliament in 1988. And in 2012 it was declared a minority institution by the National Commission for Minority Educational Institutions (NCMEI), reserving 50 per cent of seats for Muslim students.